The company will hold an Open House on June 15th to showcase new equipment and capabilities. We are excited to be on a growth trajectory and investing in our business. 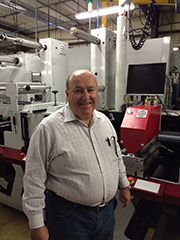 Express Label, a leader in custom pressure-sensitive label solutions, has recently added new equipment and capabilities as part of a multi-year strategic growth plan. The 25-year old company added a Mark Andy P5 Performance Press to its fleet of flexographic presses to meet the growing demand for prime labels, especially in the food and beverage industry. The 13” 10-color servo-based press will run water-based and UV inks to produce high-quality prime labels while achieving operational speed and efficiencies. In addition, the company has upgraded its pre-press operation to a fully automated ESKO workflow system leveraging computer-to-plate technology for impeccable quality and speed. To showcase these new prime label printing capabilities, Express Label will host an Open House to customers and the community on Wednesday, June 15th, beginning at 12:00 PM. Visitors will be able to learn about Express Label, tour the plant, see live demonstrations of the new equipment and take home sample labels. Express Label custom manufactures pressure-sensitive labels for customers in the Cosmetics, Health and Beauty, Food and Beverage, Nutraceuticals, Industrial, Pet Care, Household Products, and Warehouse and Shipping industries. Their label solutions include pressure-sensitive paper labels, pressure-sensitive film labels, pressure-sensitive tag labels, non-pressure-sensitive tags, printed tape, thermal labels and instantly redeemable coupons (IRCs). Express Label is located in Longwood, FL and online at http://www.ExpressLabel.net.